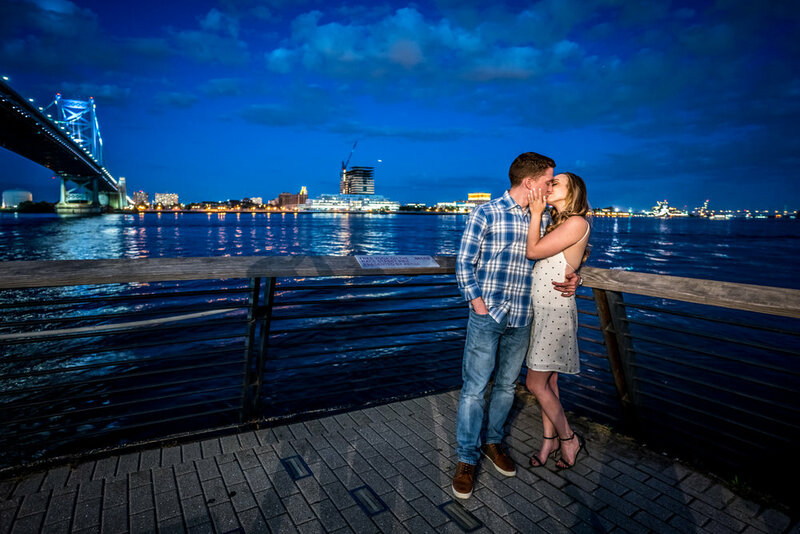 20 Gorgeous Engagement Photo Locations in Philadelphia. 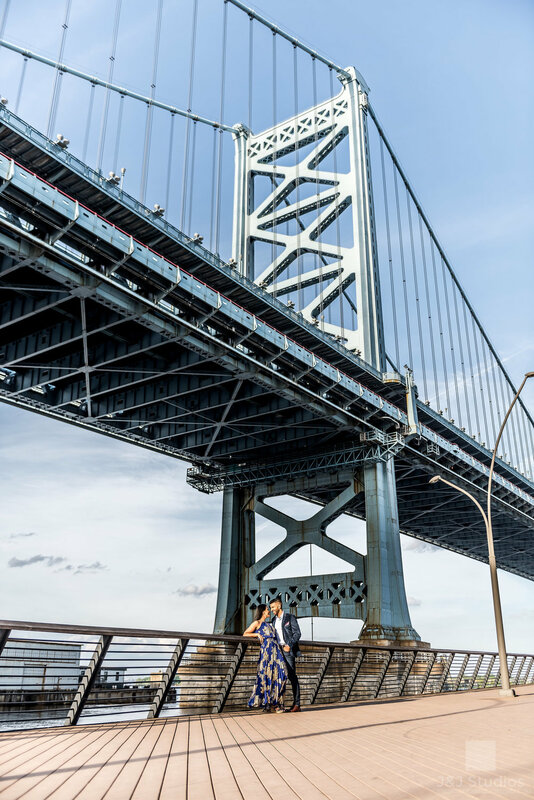 This guide covers the 20 best locations to take engagement photos in the Philadelphia area. We include greater Philadelphia areas to include the suburbs outside of Philadelphia but all locations are within an hour’s distance of Philadelphia. We are so excited to share this list of the top Philadelphia engagement shoot locations with you! 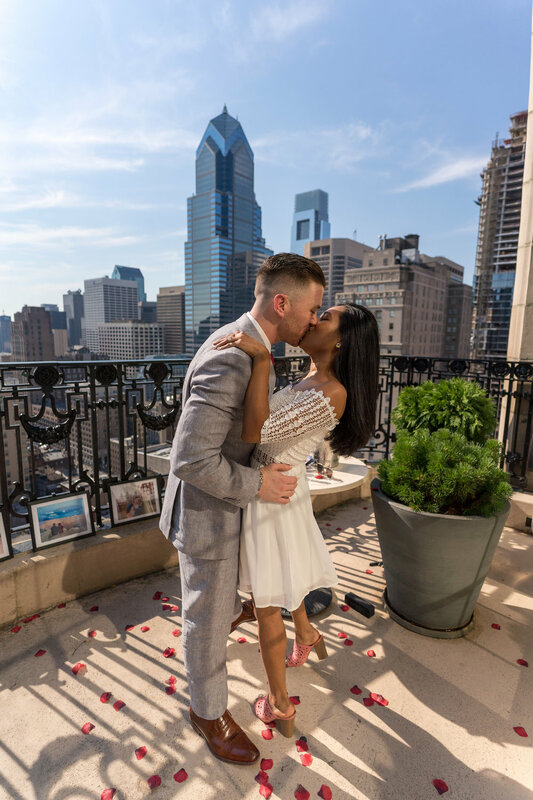 To help you find a beautiful backdrop for your Philadelphia engagement, we have compiled a list of the top 20 locations in Philadelphia. These locations are in no particular order, but we tried to feature a broad cross section of backdrops—some urban, some park atmosphere, others with gorgeous views, etc. Race Street Pier is an amazing venue for engagement photos. It overlooks the Ben Franklin Bridge and Delaware River Waterfront. Race Street Pier makes for epic environmental portraits day or night. This urban plaza features most iconically: the infamous Robert Indiana LOVE sculpture. It is a hop skip and jump away from the next location (City Hall) on our list, so it often makes sense to have photos taken at both locations. Engagement photos at LOVE Park at night can be pretty epic! Philadelphia City Hall has the distinction of being the largest municipal building in the country and is built in Second Empire style. It was begun in 1871 and took 30 years to complete. Obviously a place like this screams epic environmental engagement portraits showcasing urban architecture. However, most couples don’t realize there’s also an opportunity to do some really intimate romantic portraits here too. Philadelphia City Hall is also a classic location for a proposal. We’ve done our fair share of proposals here. Longwood Gardens is located in Kennett Square, PA and while technically not being IN Philadelphia, we did say “greater Philadelphia area engagement locations” at the start of this list. Go ahead. Check. That’s what I thought. Longwood has to be included because it is such a popular engagement session spot. There is a $23/person adult admission fee and you can’t set up light stands or tripods so beware of that. You don’t need any official permit, but as a rule, your photos can’t disrupt the “enjoyment of other guests” so be conscious of everyone in your vicinity during your engagement shoot. Cira Green is probably one of the best locations for an engagement. You get soaring views of the Philly skyline. This park has the unique feature of being elevated 95 ft off ground level. It is a development of the Brandywine Realty Trust. Just make sure to watch out for the wind! Scheduled operating hours are 6am to 10pm during the summer months, and 7am to 8pm the remainder of the year. Open 7 days a week. No permits needed to shoot here. The John Heinz National Wildlife Refuge, located near the Philadelphia International Airport, is a scenic getaway from the hustle and bustle of Philadelphia. It was established in 1972 as America’s First Urban Refuge. The Tinicum Marsh is home to 300 plus avian species and great for bird watching. For nature loving couples, this is an excellent spot for an engagement or proposal area. Various lookouts let you gaze out at the beautiful tidal marshes of the Delaware Estuary. 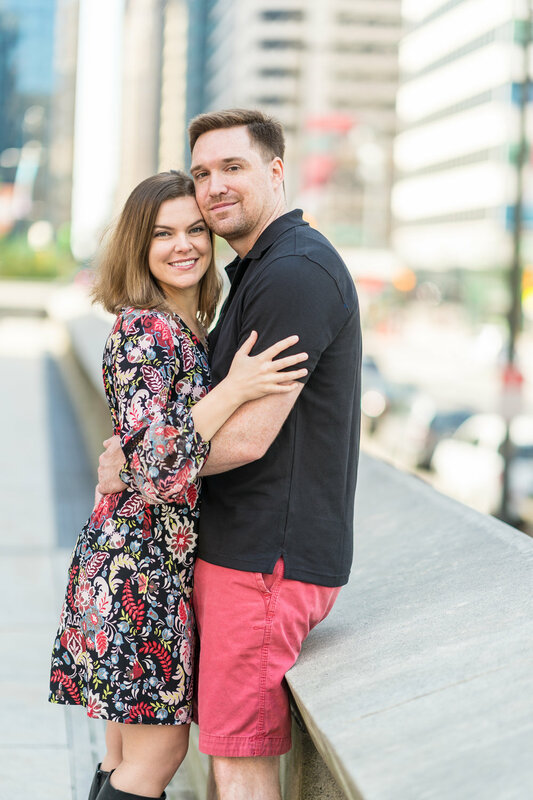 A Philly engagement list would not be complete without featuring some of the several high rise skyscraper locations for proposals / engagement shoots. This is an upscale restaurant serving New American fare in a beautiful Art Deco space on the 37th floor of Two Liberty Place. The restaurant features panoramic wall to wall views of the city that stretch for over 40 miles. At night there is no better view for breathtaking Philadelphia proposal photos. The Philadelphia Museum of Art is home to some of the most iconic features of Philadelphia - The Rocky Statue, the Azalea Garden, and Pearlman Building. The Philadelphia Museum of Art sits on a rise at the end of the Benjamin Franklin Parkway. It is one of the largest art museums in the country. With such expansive views and towering columns, the Philly Art Museum is usually one of the icons Philadelphia couples like to use for engagements or proposals. The Fairmount Water Works was originally opened in 1815 as the sole water pumping station for the City of Philadelphia. The site is now an educational center for water conservation and houses an interpretive center which features education about the Delaware River watershed, its past, present and future. The site is used by Cescaphe to host weddings and formal events. 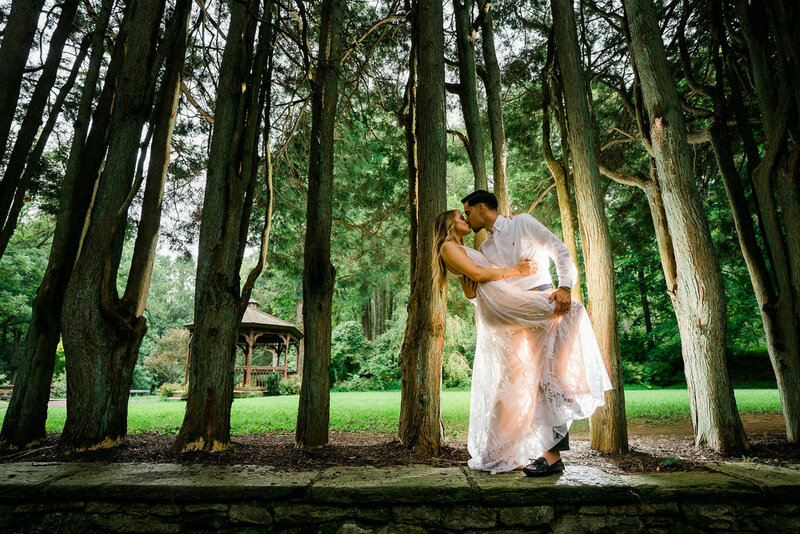 It is a great place for engagement and proposal photos as the gracious Neoclassical architecture, gazebo, columned walkways and vistas of the Schuylkill River make for fairy-tale imagery. It is within walking distance of the Art Museum, so we decided to list this engagement location next. Unfortunately, there is not an exact address for this spot, but we dropped a pin on google maps that will give you the general area. Really any place along the Schuylkill is good for engagement or proposal photography, but this area is easily accessible with many parking areas just off of Kelly Drive. This is a beautiful park like atmosphere easily accessible from Center City, South Philadelphia and West Philadelphia along the sprawling Schuylkill River Trail. The area features beautiful views of the Schuylkill River but you can also find benches, bridges, sculptures, and park areas to use for engagement backdrops. 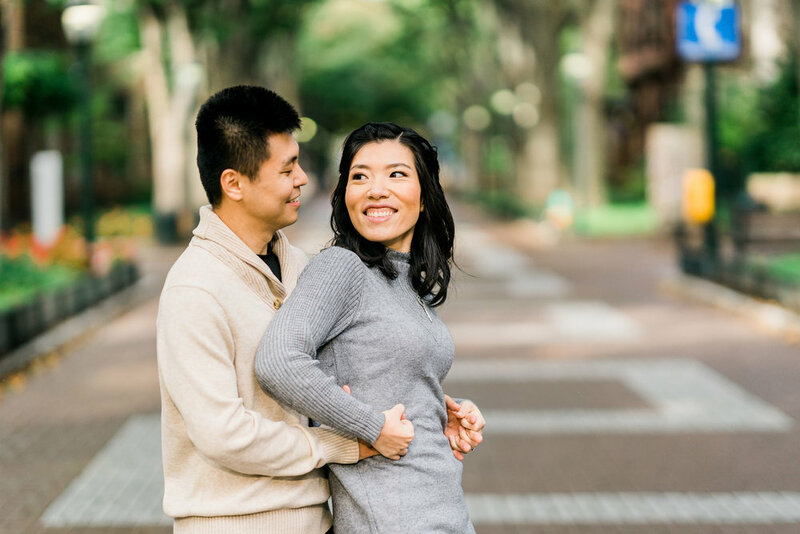 Rittenhouse Square is the perfect place for both day and night time engagement photos. Rittenhouse Square is one of five original squares planned by William Penn for the city of Philadelphia. Rittenhouse, long known as one of the most expensive and exclusive Philadelphia neighborhoods, features beautiful Rittenhouse Square, a handsome, tree-filled park with a large planter bed and reflecting pool surrounded by a circular walk and ornamental lamp posts. Beware, this park is always packed so if daytime photos are your thing, a sunrise session might be suggested. The Free Library of Philadelphia (Park Central Branch) is a stunning Beaux Art building on the Benjamin Franklin Parkway, not far from the Art Museum. According to its mission statement, “The mission of the Free Library of Philadelphia is to advance literacy, guide learning, and inspire curiosity. Its vision is to build an enlightened community devoted to lifelong learning.” The library was recently renovated, and only recently reopened to the public. 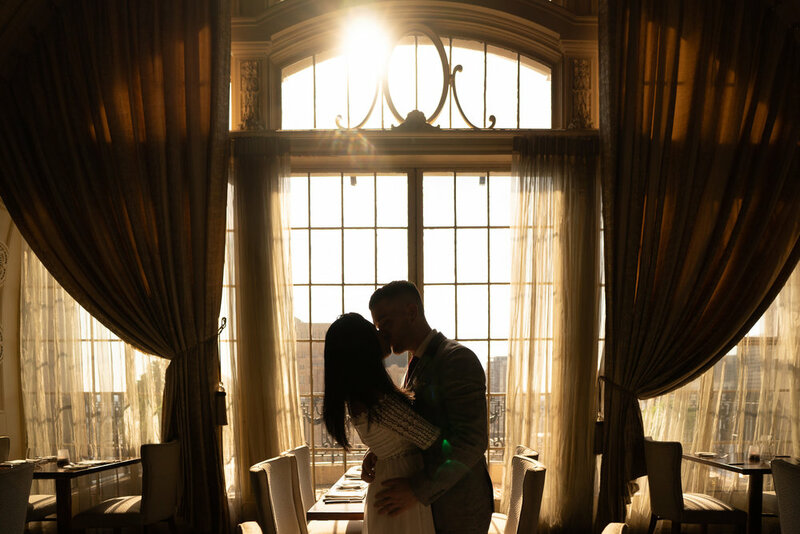 The library is a stunning backdrop for engagement photos, but don’t take our word for it, check it out below. Fun bonus fact: Forbidden Drive was so named because in the 1920s, cars were banned from using it. Today it is open to pedestrians, cyclists, and equestrians. This 8.5 mile trail extends from E Skippack Pike to Lincoln Drive through mostly wooded areas with wide gravel paths at places. This is easily accessible from the city and great for adventure/hiking/mountain loving couples. Apparently the Addison Street X-mas lights started as a tradition back in 1999 when a resident noticed that some houses on Addison Street went all out with decorations and some did not. He mused that the entire street would look so pretty if the entire street was decorated and so with some initial pooled funds of $4000, he bought the lights and rented a lift to hang lights for the street. This tradition has continued since. The lights are on year round however, but engagements and proposals around Christmas time are extra romantic at this gorgeous engagement location. Elfreth’s Alley is the oldest continuously inhabited road in America. “Our Nation’s Oldest Residential Street” according to its official site. Elfreth’s Alley was not actually in the original plans for Philadelphia. As ports became crowded, landowners Arthur Wells and John Gilbert combined their properties to form Elfreth’s Alley, named after silversmith Jeremiah Elfreth. It originally opened as a cart path in 1706. The alley is still a thriving residential community with detailed history of each home available at the Elfreth’s Alley museum house. Address: Locust Street between 37th and 36th streets. Aptly said, the purpose of Locust Walk was to turn University of Pennsylvania into “one of the most beautiful metropolitan campuses in the world.” Penn President Harold Stassen (1948). And so it has! Upenn is a city school…until you come to Locust Walk. The walk is flanked by beautiful reds, oranges and yellows in the autumn as leaves change colors. In the winter, there are Christmas lights throughout. It is truly a perfect place for a proposal or engagement shoot. 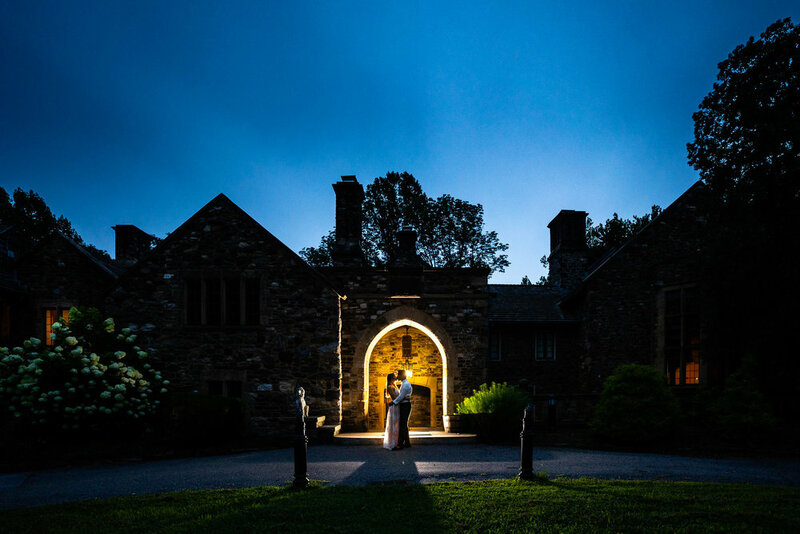 Hunting Hill Mansion is arguably one of the most versatile engagement locations on this list. There is a gorgeous English Tudor stone mansion flanked on all sides by luscious forests, a reflecting pool, tennis field, gazebo, and fountain. The grounds go on for 2000 acres and can host up to 150 guests at a wedding. It is located in the heart of Ridley Creek State Park and is exclusively catered by Parque a Peachtree Venue. Nothing says “Marry Me” quite like renting the entire Kimmel Center to get down on bended knee. The Kimmel Center includes the Kimmel Center, Academy of Music and the Merriam Theater. The venue is available for rental for up to 200 guests for your wedding. Nineteen Restaurant is an ornate New American seafood restaurant on the 19th floor of the Hyatt at the Bellevue. They have a large rotunda with gorgeous pearl chandelier and a balcony with soaring views of the Philly skyline and Avenue of the Arts. The perfect place for a proposal or engagement. XIX can also be rented for wedding receptions and unforgettable private events. Located on the western side of City Hall, Dilworth Park is an open space featuring stunning fountains, steam vents and dual beautiful glass tunnels providing access to the Broad Street and Market Street subways. It also features some landscaped flower benches and outdoor grill and cafe. The possibilities are endless to create amazing engagement images here. John Ryan is the owner of J&J Studios Philadelphia. J&J Studios provides wedding, portrait and corporate event photography and videography services for clients in the greater Philadelphia area, NJ, NY, DE and MD. J&J Studios is available for travel worldwide. Like what your see? Let’s get in touch! Thank you! We’ll get back to you as quickly as possible. Usually within 24 hours.